On our third day in Hawaii (Wednesday, May 19) Bob went fishing with John and Jim (John’s fishing partner). Thank you, John and Bob, for providing details of the fishing trip. Bob and John met Jim at approximately 6:00 AM at Honokohau Harbor, just north of Kona. It was raining at the harbor, but clear to the north. They headed north after launching. According to John, they traveled about two miles north and then doubled back to troll eight miles south in “Ono Lane” or “Ono Alley”. Their first “double” hit was about 20 minutes north of the harbor off of Pine Trees Beach. They got one Ono in, but lost the other one when the swivel holding the hook to the lure broke off. The Ono they got in the boat was the smallest of the day at about 20 pounds. About two hours later they got the second “double” about 8 miles south of the harbor. They got both of those in the boat, and they were about 25 and 32 pounds. Bob reeled in the first and last ones of the day, smallest and largest, just over 50 pounds of fish. Upon reaching Kealakekua Bay (where Captain Cook met his demise), they headed offshore from Ono Alley to try and hook up with a Marlin or Mahi Mahi. No luck for the rest of the trip. They did bring in almost 80 pounds of fish, though. Jim and John consider that a good day. This was Bob’s first experience fishing on the high seas. Even though Bob threw up one time while fishing, he had a wonderful time and hoped to have the opportunity to go fishing again before the end of our vacation. 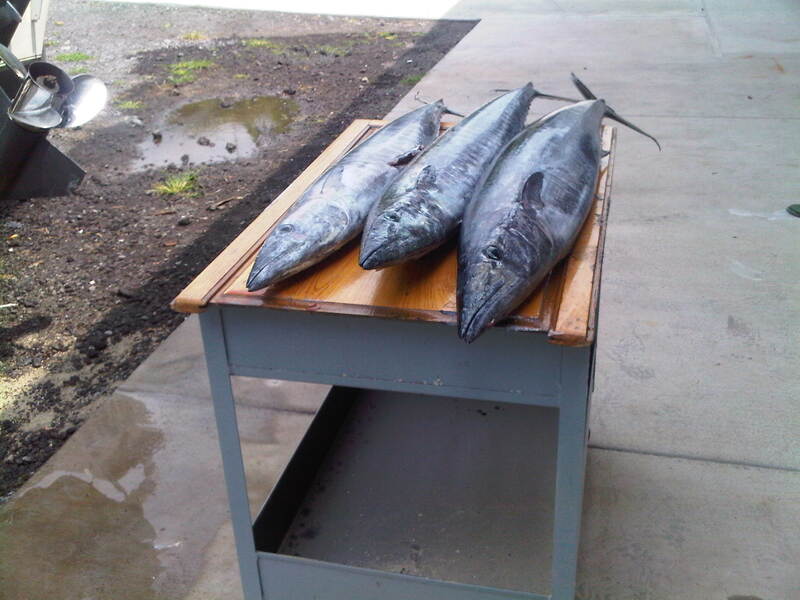 Bob took this picture of the three Ono that he, John and Jim caught. 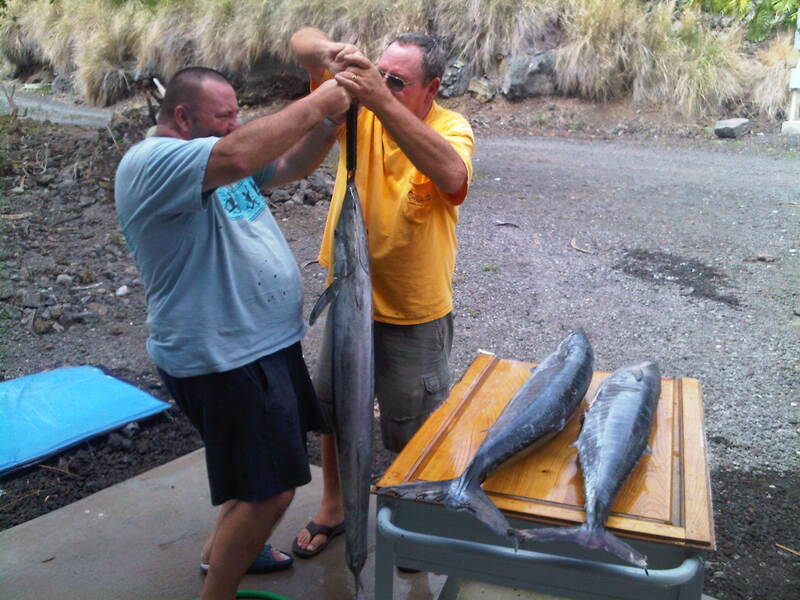 Bob took this picture of John and Jim weighing the largest Ono. Can you guess what we had for dinner that evening? The Ono was indescribably delicious! John receives a newspaper that includes a section called Kona Fishing Chronicles, which is written by Jim Rizzuto. On May 24th the Kona Fishing Chronicles included an article entitled “Migrating fish find their resting spots”. A portion of that article described two true fishing stories that I would like you to read. The first story happened a day before Bob and John’s fishing trip. The second story happened the day of Bob and John’s fishing trip. “Rich Youngs had the lone fisherman’s dream and nightmare combined into one last Tuesday. Rich was trolling his skiff alone down ono lane at 7:30 a.m. when all five lines went off at once. Rich had just trolled over that rarity, a large pack of aggressively feeding ono. With no help, he still managed to bring in four of the five fish and get back to the harbor at 10 a.m.
After the quintuple strike, he and all of the rest of the fleet he had attracted swept the area without another strike. He either got all five fish in the school or the only five gullible ones. Sometimes catching an ono is a mixed blessing of sorts. The fish is slippery and slimy, which makes it hard to handle, and is armed with a mouthful of the most dangerous teeth in the ocean. Dave Anderson and his son heard about Rich Youngs’ success and tried to emulate it the next day on their boat, Uilani. After leaving the dock at 5:30 a.m., they immediately hooked an ono off Kaiwi Point and found it in the wind and rain. After they got it aboard, the slippery, bouncy deck gave the advantage to the ono, which promptly bit Anderson the younger in the foot. The Andersons were at Kona Community Hospital by 7 a.m. and were finally finished with treatment eight hours later. Even a 21-stitch gash doesn’t take precedent over cardiac cases and auto accidents. The doc spent two hours cleaning and stitching the wound and put him on antibiotics for two weeks, Dave said. The guy grew up locally and knows about these things. Junior offered him a piece of the fish, and he said no way because he knew where the fish’s mount had been. That would be chewing on dirty stinky foot, Dave said. At one point during Bob’s fishing trip, Bob was cautioned to keep the mouth of the Ono away from Jim’s foot. After reading this article, I can see why! Stay tuned! I have lots more photographs and details of our Hawaiian vacation to share with you! I received a comment on this post by email from a friend, Chris C., which I want to share with you. “Ono, which means “the best,” is also known as wahoo. They are very fast, have very hard mouths, and those teeth are like razors. When you start catching them, they rapidly become “line weary” and you have to use smaller line to get one to bite. Their mouths are so hard you can't really set the hook, and have to reel constantly to avoid losing them. They are a white meat fish, and very firm, with no “fishy” taste.”Thank you, Chris, for this most appropriate description of Ono! @Ram – No, I didn't join the boys. I had a bad experience with seasickness a while back. I didn't want to repeat that experience. Besides my not being on the boat allowed for male bonding. As you will find in my next blog post, I occupied myself with an activity that I find most enjoyable. I've never heard of this fish – fascinating. Wow, they are some big fish. I do not think I would want to be around fish that bite. LOL! It is suppose to be the other way around. I look forward to reading more about your Hawaii trip. Linda: Oh no, I guess you ate an Ono. The seas looked a little rough. Great photos! Hope you're having a wonderful weekend! I had never heard of Ono til now..so went and read about them before finishing reading this…very nice post Linda. Loved the stories you included at the end. Wonderful fishing expedition,they are huge fish. Until I read that the Ono has no fishy taste, I thought what a lot of trouble catching them must be. Although, the sport sounds like just the sort of thing a guy would enjoy conquering. 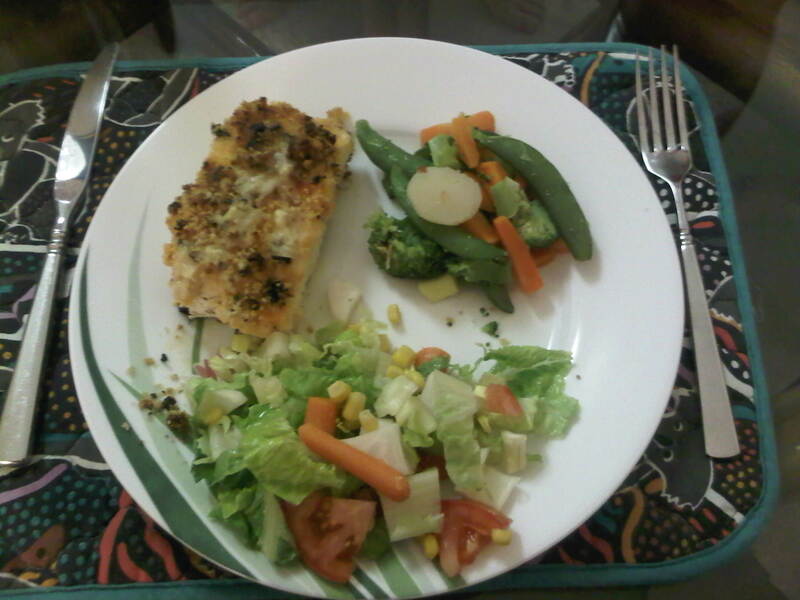 As you might have guessed, I'm not much of a fish eating person…except those who don't taste like fish. The trip sounds like an adventure. I bet it was fun. That was one exciting fishing trip Linda. Nothing like eating fresh caught fish. Interesting story on the Ono also.